In the first three days of a piglet's life, one of the biggest threats to its survival is its own mother. 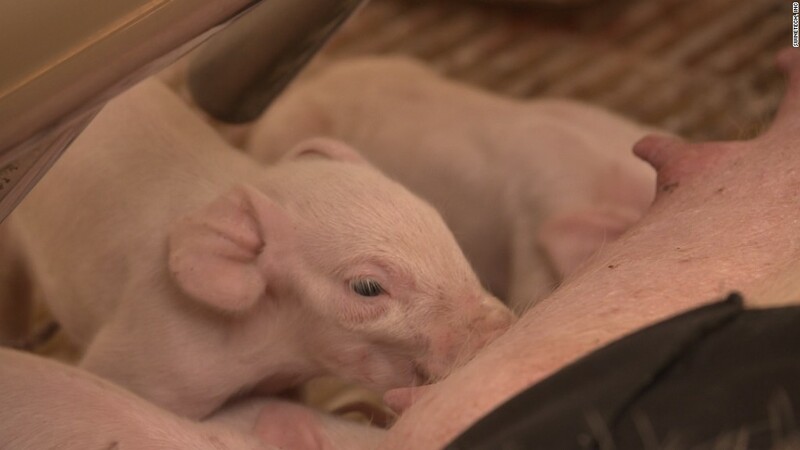 As many as 6 million newborn piglets are accidentally crushed every year under a mother sow, according to Sherrie Webb, director of animal welfare with the National Pork Board, citing data from the USDA. That's nearly 5% of all piglets, and it's a problem pig farmers have grappled with for decades. Matthew Rooda, a senior at the University of Iowa, has developed a controversial tech solution that he said could help save piglets' lives. 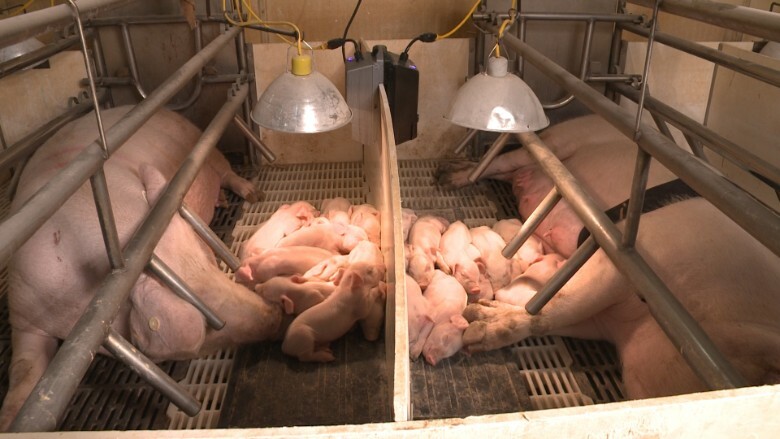 The system, called SmartGuard, is a device that monitors the wavelengths and frequencies of piglets' squeals. There is also a light-weight belt placed around the sow. Using proprietary software, SmartGuard filters through squeals and detects when a piglet is in distress. At that point, it delivers a "vibration" to the sow's lower stomach through the belt. The vibrations are 25% to 50% milder than those from a dog shock collar, said Rooda. The purpose, he said, is to startle the sow into shifting positions or standing up. "If the first vibration doesn't work, we wait five seconds and do it again and then again once more after another five seconds," said Rooda. But the belt is controversial in the industry, which has moved away from using electric stimulation to move or handle pigs, according to Webb, director of animal welfare with the National Pork Board. Rooda said his startup SwineTech worked with veterinarians to ensure the device wouldn't be painful to the animal. "We follow protocols [and] industry regulations," said Rooda. "We think if those concerned learn about our background and product, they will see that this is a system that will significantly improve the well-being of sows, piglets and farmers." The pig farming industry has grappled for decades with the problem of newborn piglets being accidnetally crushed under the weight of the mother sow. SmartGuard monitors piglets' squeals for four to six days after birth. Rooda said the system, on average, would be triggered two times in that period to make a sow move off her piglets. "We hope over time the system can train the same animal to not lay on its piglets," said Rooda, 23, who developed SmartGuard with his classmate Abraham Espinoza, 24. They launched the concept in 2015. Rooda himself grew up on a pig farm and worked as an assistant manager on a pig farm in Waterloo, Iowa. His background gave him firsthand knowledge of the problem. "It drove me crazy," he said. "I realized if this was happening on my farm it was probably affecting all producers." Accidental crushing also results in lost revenue -- each piglet is worth about $45. SwineTech spent two years developing the technology, raising money and testing the system on pig farms. Year-long pilot tests on four farms showed a 74% success rate, said Rooda, adding that it saved more than 1,000 piglets. So far, SwineTech has raised $1.6 million from startup contests, grants and funding from outside investors. Three large commercial pig farms in Iowa, Illinois and Tennessee will deploy SmartGuard units in the fall. Rooda said a farm with 5,000 sows would need 74 systems (which cost $1,200 each). Rooda said the next iteration, which will be available next year, replaces the belt with a wearable patch that works the same way. As more people in the industry become familiar with the product, Rooda expects it will help allay concerns. "We've worked with animal welfare specialists and veterinarians throughout the process to ensure our system doesn't harm -- but helps -- the animals," said Rooda.